New kid on the block: Kaosan's half grilled chicken. There are many things I am not good at; secrets is one of them. It comes with the territory. Journalists do what they do out of a compulsion to find out stuff and then bellow annoyingly about it. And yet some people still assume I keep certain restaurants to myself. It’s bizarre. My job is to find terrific places to eat and tell you all about them. As we know, this is about as straightforward as locating a virgin in the sixth form of Cheltenham Ladies’ College, so if I do find one I’m hardly likely to keep quiet about it. There will, I know, be some people in my neighbourhood who will object to me writing about Kaosan, a startlingly good new Thai cafÃ© that opened a few weeks ago in the old shopping arcade now called Brixton Village. Parts of Brixton are a bit like that: prone to suspicion of anything they think smacks of abandonment of the local community. True, Brixton remains an inner-city area with its own unique challenges, but the facts are these: by 2009 the old Granville arcade off Coldharbour Lane had become a sad affair of empty shop units. Now it is alive and boasts a bunch of interesting eating opportunities. Kaosan is one of them â€“ a simple family-run restaurant with space for about 25 people. The menu is short, cheap and packed with flavour. Skewers of pork, still smoking from the grill, arrive with a sweet-sour chilli and tamarind dip that makes you open your eyes wider. A rustling pile of deep-fried pastries filled with minced prawn and chicken is served with a sweet chilli sauce that clings to their every nook and cranny. Larger dishes are mostly curries and salads: a hot and sour green papaya salad with chilli, or a terrific larb gai, the famous salad made with minced chicken and dressed with a fruit bowl’s-worth of lime juice and many other good things besides. A dark, coconut milk-rich massaman lamb curry had one of those sauces you just couldn’t help spooning straight from the bowl. Even a more familiar dish, like their chicken green curry, is a cut above. It’s as though the colour definition has been tweaked. All of this comes with an impeccable sticky rice. 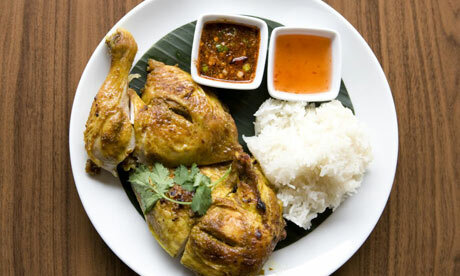 The only main dish costing more than Â£6.90 is the long-marinated, grilled half- a-chicken. Ooh, the crisped skin! It costs Â£11.50. They are unlicensed but will happily open your bottles for you, and the place has a glorious, steamy bustle and rush. Brixton Village generally keeps daytime hours, but from Thursday onwards it tends to open later. It is best to call ahead to check, not least to see if they have space. On a Friday evening there were free tables before 9pm. It won’t be like that for long.